I am a little confused as to what comes out this week, actually. I am 100% certain that End of Watch, Bachelorette and Housos vs. Authority are released in cinemas this week, but I have also read on different occasions that The Giants, You Will Be My Son, The Expatriate and Sinister are released too. End of Watch - From the writer of Training Day, End of Watch is a riveting action thriller that puts audiences at the center of the chase like never before. Jake Gyllenhaal and Michael Peña star as young LA police officers who discover a secret that makes them the target of the country's most dangerous drug cartel. Bachelorette - On the night before an old friend's wedding, three frisky bridesmaids go searching for a little fun but find much more than they bargained for. With lovely Becky (Rebel Wilson) set to marry her handsome sweetheart, Dale (Hayes MacArthur), the remaining members of her high school clique reunite for one last bachelorette bacchanal in the Big Apple. Regan (Kirsten Dunst) is an overachieving, ueber-Maid of Honor who's secretly smarting over the fact that she's not the first to marry, while Gena (Lizzy Caplan) is a whip-smart sarcastic who's actually a closet romantic, and Katie (Isla Fisher) is a ditzy beauty who loves the good life. But when Becky insists on keeping the bachelorette party tame, the women proceed with an after-hours celebration of their own. My friend Chris has reviewed Housos vs. Authority at An Online Universe, and I checked out You Will Be My Son earlier in the year at the French Film Festival. Until I watched Cafe De Flore it was the best of the fest. The Giants has a small release at the Chauvel and I'm pretty certain the other two listed above have been shifted to another week. 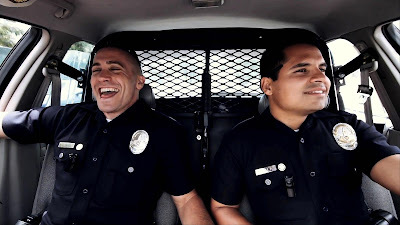 Weekly Recommendation: I laughed a lot in Bachelorette, and End of Watch (which I will endeavour to see next weekend) has been well received in the States. Depends on what genre you feel like - found footage cop drama or gross out comedy. On November 8 two of the big Oscar favourites, The Master and The Sessions, hit cinemas so they're worth waiting for.